In our household we have two dogs, Spencer who is a 9 year old Goldendoodle and River who is a 1.5 year old Black Mouth Cur. We adopted River just over a year ago from an amazing rescue. Since that time, when we leave our house she is kenneled up, while Spencer is free to roam the main floor. My husband thinks it is time to transition her from the kennel. However, I like the peace of mind having her kennel knowing she is safe and not making any mischief. 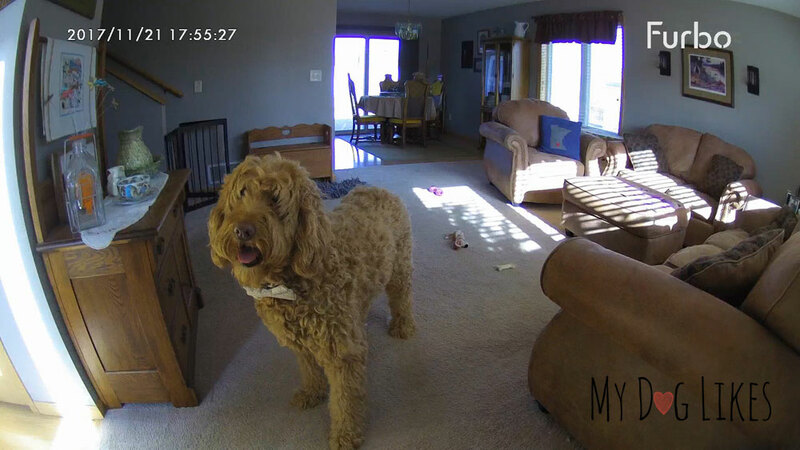 We were recently given the opportunity to test out the Furbo Dog Camera, which we hoped would give us both what we want, River her freedom and me peace of mind at the same time. 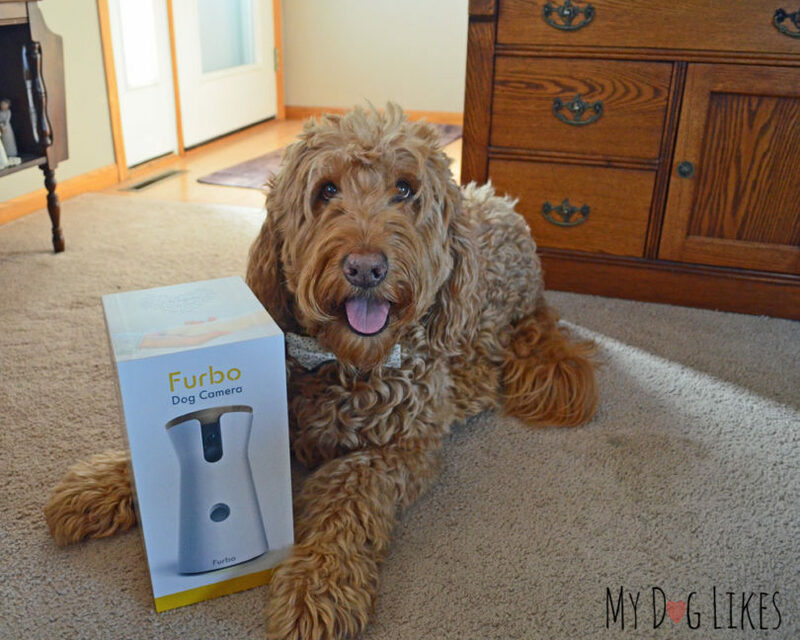 Furbo was kind enough to send us a unit to test out and they are sponsoring this post so that we can share this awesome technology with you! 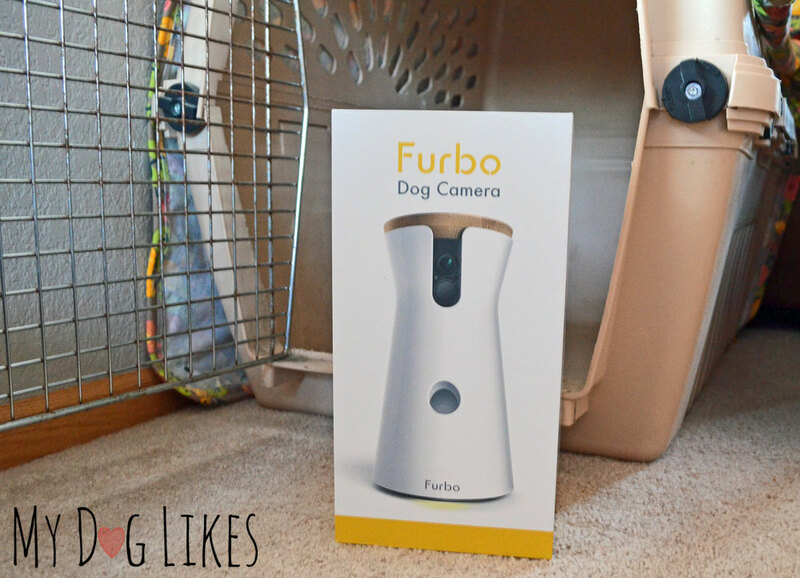 The Furbo Dog Camera is an interactive treat dispensing dog camera that offers peace of mind to dog owners. 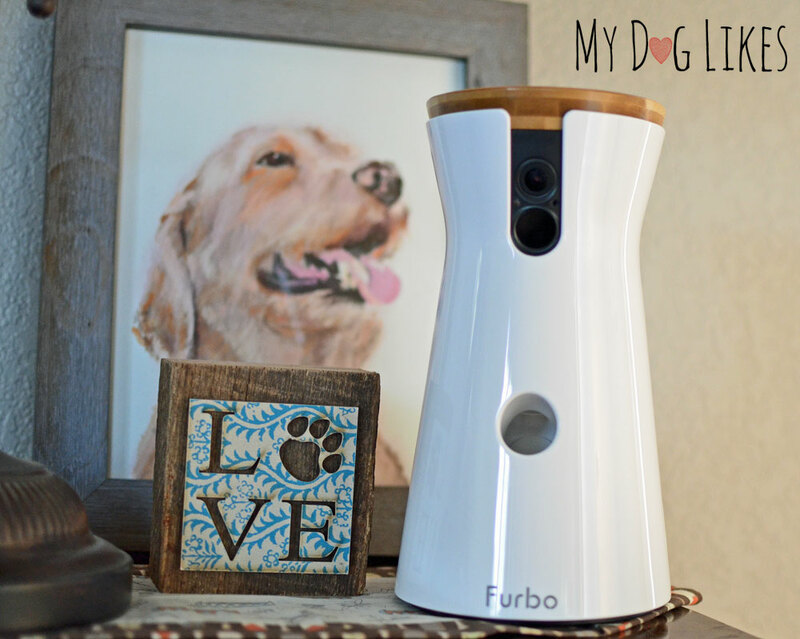 Using Furbo’s mobile app, dog owners are able to see what their dogs are up to in real time, as well as record, take photos, communicate and give them a treat all from the convenience of their phone. 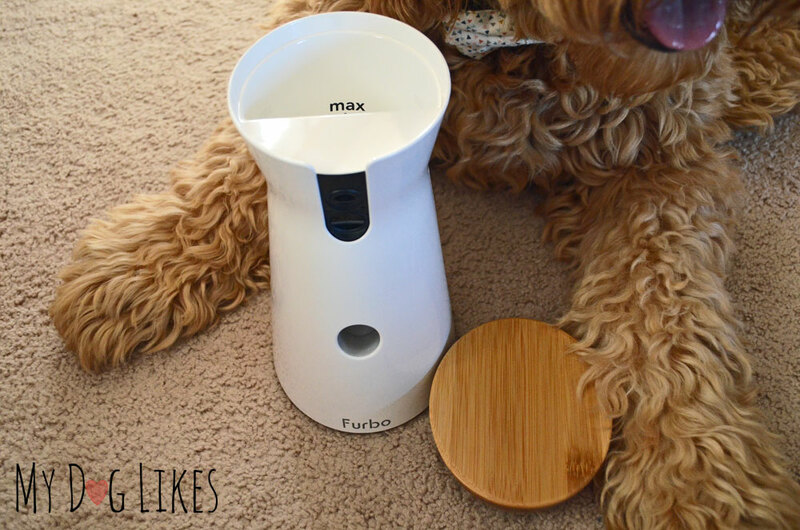 The Furbo Dog Camera has a sleek, clean design featuring a bamboo wood lid on top. This device is roughly 9 inches tall and takes up less than 5 inches of surface space. I was amazed how fast and easy it was to set up this product. The quick start guide not only provided easy step by step directions, it also featured clear images showing exactly what you need to do. Plug the USB into the Furbo power adapter and the Micro-USB into the Furbo, then plug into an outlet. Next, using your phone, download the Furbo app. 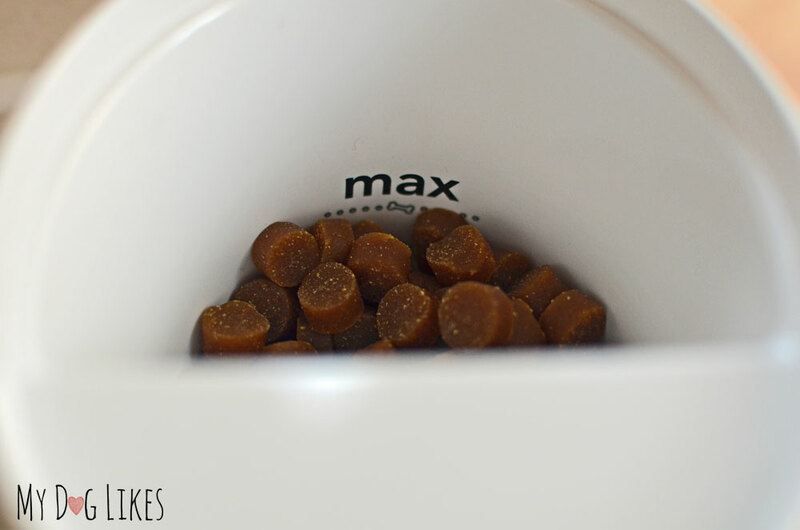 While the Furbo app is downloading, fill your Furbo to the “max” line with your dog’s favorite treat. Make sure the treats are round and smaller than 0.4 inches. 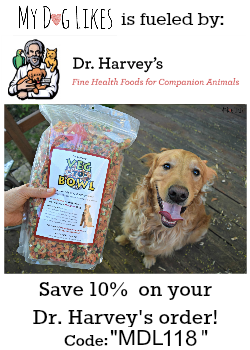 The Furbo can hold roughly 100 treats of this size. Once the app is downloaded, you are going to want to connect with your Furbo. Once the light on the Furbo is yellow you are connected. Next, simply select your WiFi and enter your password. When you have fully connected to your Furbo you can move/position your Furbo to the perfect spot. Using the video feed, position the Furbo where you get the best view with minimal blockage. Now you’re ready to go!!! While I was still at home it was important for me to show Spencer and River this product. They watched as I was pouring in the treats and I made sure to drop a few so they would become comfortable around the Furbo. I then started playing around with the app and quickly discovered how to dispense the treats. Once I clicked on the “treat” button a squeaking noise came from Furbo, and you could hear the treats fall into the launcher before being sent into the air. That’s right, they didn’t just fall out of Furbo but instead they went flying! Since I used Zuke’s mini treats, which are tiny, 3-4 treats launched in the air at one time. Having two dogs I liked that multiple treats dispensed so there wasn’t any fighting over them. The Furbo was very easy to set up. Normally, I need my husband to help me with “tech” products, but with the Quick Start Guide and the set by set directions I had the Furbo set up in less than 5 minutes. 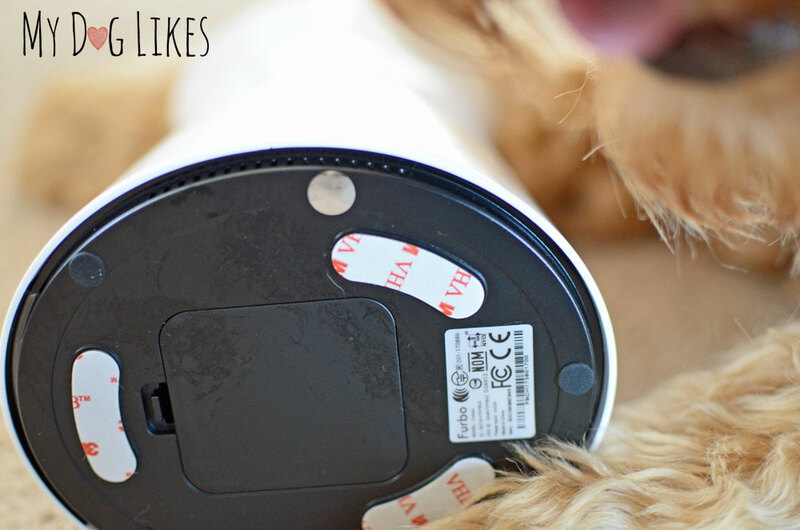 Since Furbo launches the treats, instead of dropping them, it’s like playing a game of fetch. I’m sad to report, when I was gone and dispensed some treats, both dogs went running away. Spencer is a nervous dog by nature so he didn’t like the sound. And River followers what her brother does. I’m going to keep work on this while I’m at home and I’m keeping my paws crossed they begin to like receiving treats from Furbo. Using the snapshot feature I took both video and photos with Furbo and the pictures turned out nice and clear. 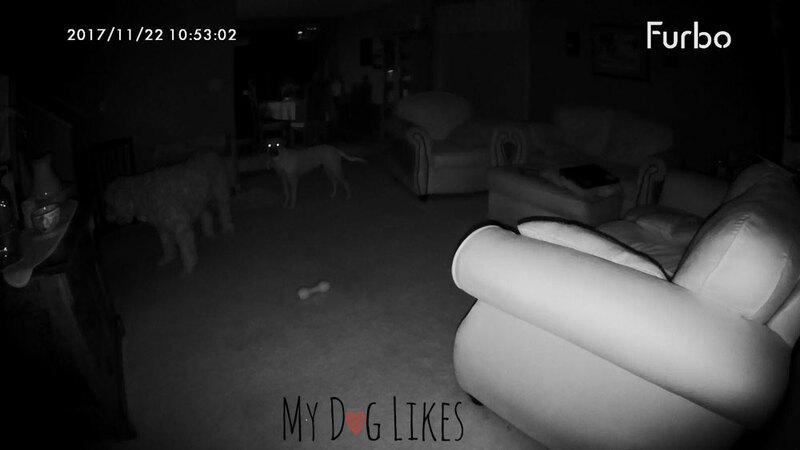 I didn’t notice any lag in the video and the night vision works extremely well. When testing Furbo out, I drove to a nearby town to see how well the connection worked away from the house. I was able to easily connect to the feed in a matter of seconds to see what my pups were up to. The 2-way audio also worked amazing. I could hear Spencer and River clearly, especially when they were barking. Just like the treat launcher, when I talked through the app, the sound/noise scared them and they ran from Furbo. This is something I’m going to keep working on with them. 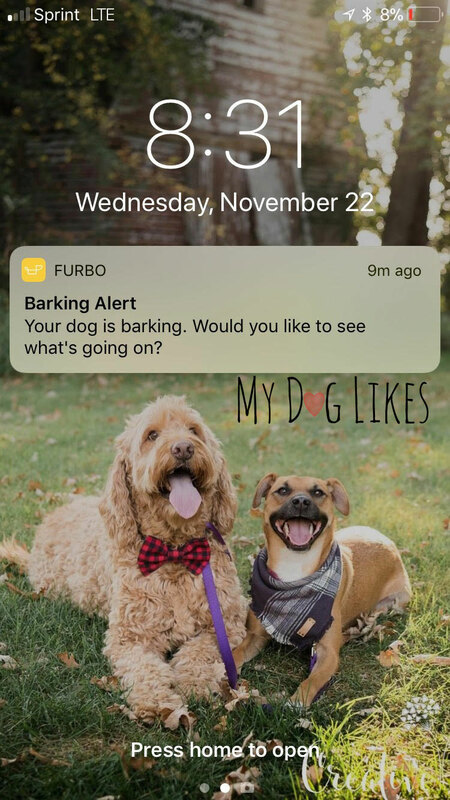 One of the best features is the “Bark Sensor.” Each time one of the dogs would bark an alert would pop up on my phone informing me one of the dogs is barking. And it would ask me if I would like to see what was going on. The Furbo has been a great way for us to transition River from the kennel, while still giving me peace of mind that she isn’t destroying the house or bothering Spencer. With the great connection, checking on them without having to run home has been a blessing. The clear picture and wide angle lens allows me to see the entire main floor except the kitchen. 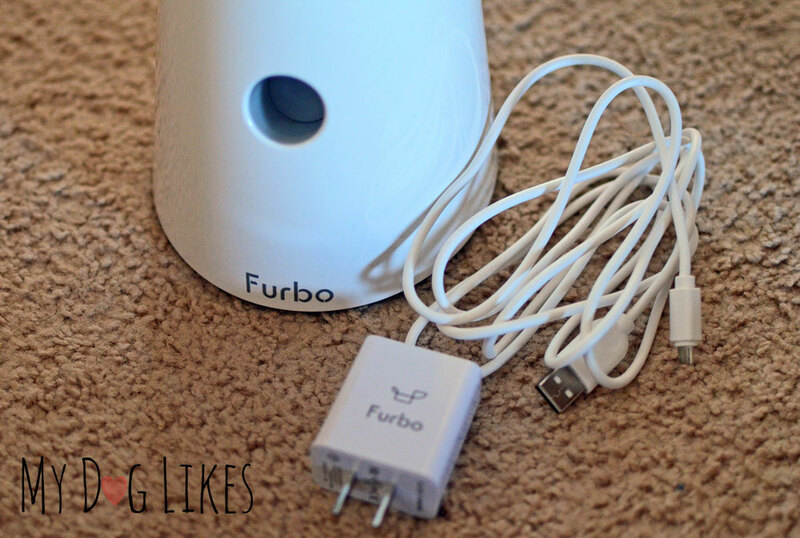 So far, Furbo has been a great tool for us as dog owners, and would make a great gift for dog lovers. Want to try out the Furbo for Yourself? Nurse by day, blogger by night, and full time dog mom! Living in Minnesota, my husband and I are passionate about two things - our rescue dogs and taking advantage of all four seasons. 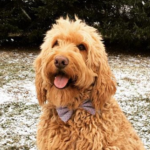 Our furry little ones include Spencer, a 10-year-old Goldendoodle, and River, a 2-year-old who is believed to be Black Mouth Cur rescued from a high kill shelter in Alabama. Whether it is warm or cold, our family finds adventures around every corner! 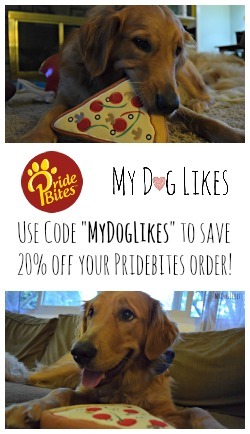 Visit Brittany's blog at Spencer the Goldendoodle! My husband and I were just wondering if there was a product like this to try for our pittie rescue who has separation anxiety. Thanks for the thorough review! 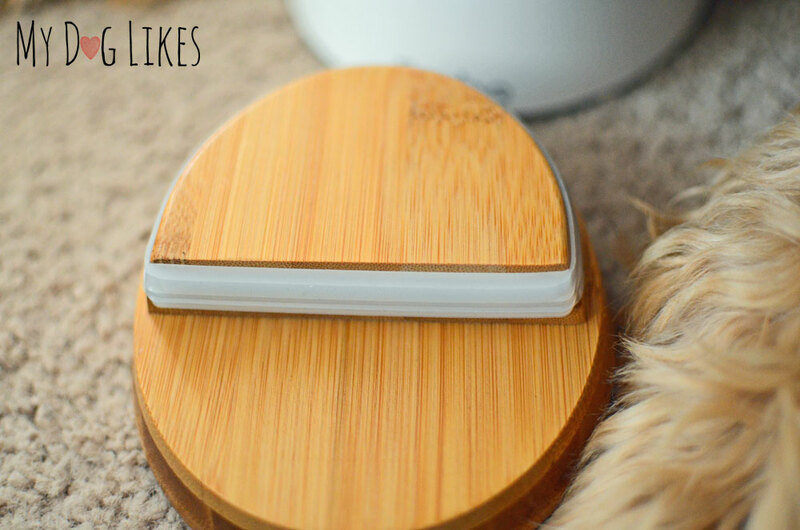 Thanks for stopping by and if you do give it a try please let us know how you liked it! wow! What a cool gadget, it really helps to monitor your puppies. Great product indeed.